World in Motion: Please, just leave the beer alone! Please, just leave the beer alone! How many times do I have to say it! Beer is not meant to be tampered with, just leave it as it is!! 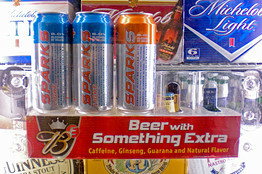 MillerCoors has come under fire from the states as well as from several consumer advocacy groups for apparently trying to market their popular Sparks brand to underage consumers. Critics also complained that the drinks raised potential health risks by masking feelings of drunkenness. MillerCoors has now agreed to remove content on the Sparks Web site that "looks like it was created by a college freshman." Additionally, the company will also eliminate images that imply energy or power, such as the battery themed symbols on Spark cans. At the end of the day they got what they deserved! Beer is to be enjoyed as it is and no other way!